The German Bundesliga returns with Borussia Dortmund leading the pack at the halfway mark. BVB have been exceptional to say the least with their arch-rivals and defending champions Bayern Munich trailing by six points. At the opposite end of the table, Nuremburg, Hannover and Stuttgart occupy the relegation zone, but there is plenty of time for revival and comebacks. Let’s find out what’s instore with round 18 on the menu. Hoffenheim are unbeaten in their last eight matches but have drawn their last six games on the spin. The hosts have managed just three wins from nine matches on their ground and should struggle yet again against the defending champions. Bayern Munich have the best away record in the league with seven wins from nine games. Before the break, they had won five on the trot and I’m backing the Bavarians to continue that form here. Bayer Leverkusen went into the break on a high with three wins from their last four matches, including back-to-back victories. Monchengladbach have lacked consistency, only managing to capitalize on home advantage, while battling on the road. However, I’m expecting the Borussians to remedy that side of their game and go for all three points here. An end-to-end game of football is on the cards with Both Teams to Score – Yes – tipped at 5/10. Stuttgart find themselves in the relegation/play-off promotion place and will be desperate to change that. Mainz are without a win in their last four games and have registered just two wins from eight matches on their travels. This one could go down to the wire with home advantage likely to separate the sides. With that being said, I’m backing Stuttgart to edge the win. Eintracht Frankfurt have been difficult to predict this season. While their home form is decent, they lacked consistency throughout the first half of the season. Freiburg were poor on their travels with just two wins from eight matches. They have battled to score goals, and I’m not expecting much of a difference here. Four of the last five matches between these sides have seen Under 2.5 goals. Follow the trend at 11/10. Augsburg have managed just three wins from 17 matches and are without a win in their last eight consecutive games. Dusseldorf were in top form before the break with three wins on the spin, scoring five goals and conceding just once. The hosts will be desperate to turn things around, while Flingeraner will look to pick up where they left off and I’m tipping just that. Back Dusseldorf to edge the win. Hannover are placed second from bottom on the standings with just a measly two wins from 17 matches. Werder Bremen have lost three of their last four games on the road, including two losses on the bounce. The Reds have been absolutely terrible this season and the River Islanders should have the upper hand here. Take Werder Bremen to come away with maximum points. Leipzig have been excellent on home soil as they remain unbeaten with seven wins and two draws after nine matches as well as four on the trot. 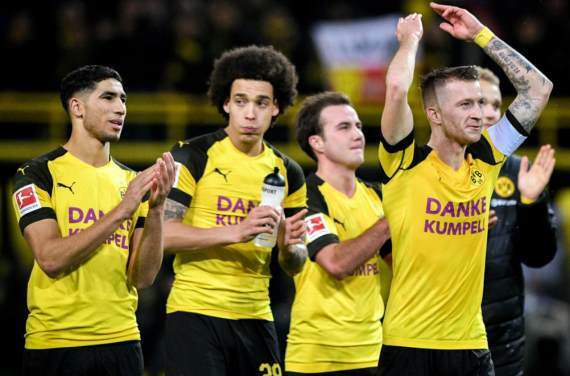 However, Borussia Dortmund have suffered just one defeat with 13 victories from 17 games. I’m banking on a goal fest here with chances created from the first minute to the last. Both Teams to Score – Yes – is tipped at 5/10. Basement-dwellers Nuremburg have lost 10 of their 17 matches, scoring just 14 goals and conceding 38 goals. Hertha Berlin have lost three of their last four games on the road, including back-to-back defeats. If you’re looking for an action-packed game, this won’t be it. Get on the Totals – Under 2.5 Goals – market at 8/10. Last but not least, Schalke and Wolfsburg will round off proceedings at the Veltins Arena. The hosts have been far from their usual title-chasing selves with a mere five wins from 17 games. Wolfsburg were in top form before the break with five wins from their last six matches. For the brave and the bold and those looking for value, I’d suggest backing the Wolves on the straight win. But if you looking for something with more promises, take Wolfsburg on the Win/Draw Double Chance at 13/20.